After a few years absence, Douglas Laing whiskies are back in Israel whisky market, represented by a new importer, Sipil Premium Alcohol. This time around we get to enjoy the full Regional malts line up and a few single malts, all priced very reasonably, so those are great news for whisky drinkers over here. The single malts range at launch consists of two entry level Provenance whiskies and two Old Particulars, so naturally we’ll start with one of the Provenances, the Mortlach 8 Year Old. Over the last few years, since Diageo has started Mortlach premiumtization process ,the count of indie releases of Mortlachs has seriously dwindled, with the rare Mortlach releases priced extremely high which is a pity because the classic Mortlach profile is so tasty (especially when aged in good sherry casks). 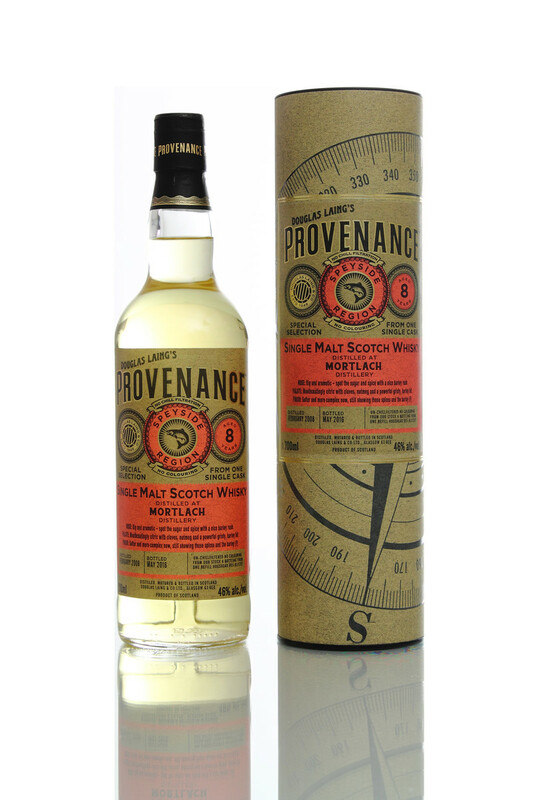 But lately we’re seeing indie Mortlach back in market, albeit with young age statement releases like this Provenance release that was distilled in 2008 and bottled in May 2016, but as long as they carry the Mortlach characteristics, we should be satisfied. Nose: Bready and pastry-y, citrus, cured meat, full bodied, pepper is lurking deep below the surface. After a few minutes there’s lemon and honey and later on there’s cinnamon and red apples, hmm lets call it red apples pie, shall we? Palate: Malty, thick, fruity with citrusy edge, white pepper, rich sweet fruit, red apples peels, cured meat, gentle oak spices. Finish: Short medium finish, bitter apples peels, lingering lemon and oak spices. Thoughts: Young, not overly complex, but oh yeah, it’s so Mortlach-y with those meaty notes and the fruity notes. It’s an excellent summer dram so I’ll be buying myself a bottle (can you have a better buy recommendation than that?). Slainte! This entry was posted in Whisky Reviews and tagged Mortlach on August 8, 2017 by Yoav @ Whisky Gospel.